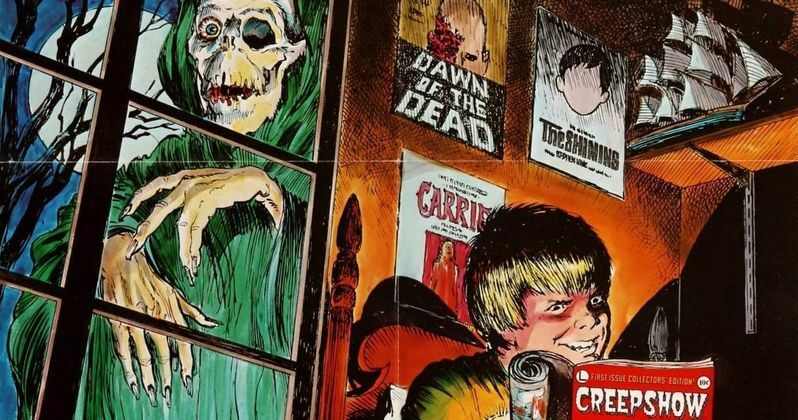 Horror fans rejoice; the Creepshow TV series has officially entered production. We first learned of the small screen adaptation of the anthology movie last summer, with horror legend Greg Nicotero, who serves as one of the chief creative forces on The Walking Dead, at the helm. Now, we have word that work on the show is underway, in addition to some very interesting new details, which should be very enticing for Stephen King fans. First off, producer Stan Spry took to Instagram recently to share a photo of himself arriving at the production offices for Creepshow season 1. The show is being produced for the horror-themed streaming service Shudder. While it isn't clear exactly what stage they're at in the production process, his post makes it very clear that they have hit the ground running, which means we should be hearing word on casting and other such info in the very near future. The post was shared by the official Creepshow account as well. Spry caption the photo thusly. "A Guy Walks into a Production office #creepshow #season1 #shudder." That's exciting enough on its own, but here's where things get very interesting. According to a new production listing, one of the episodes of Creepshow season 1 will be titled Survivor Type. The episode will center on a man who is shipwrecked on a desert island where he reflects on his life and does the unthinkable in order to survive. Survivor Type is a short story that originally appeared in the Stephen King 1985 short story collection Skeleton Crew. It's noteworthy for being one of the most gruesome tales King has ever put to paper, which is really saying something. The story centers on a disgraced surgeon by the name of Richard Pine. Whilst trying to smuggle a bunch of heroin on a boat, disaster strikes and, after narrowly escaping with his life, Pine finds himself marooned on an island. He begins to document his experience in a logbook and, as the reader discovers, not only does he slowly descend into madness, but he winds up doing some unthinkably hideous things to survive. Not to spoil it, but it may or may not involve some of the most intense cannibalism ever conceived. Take that, Hannibal Lecter. Stephen King, his son Joe Hill and Joe R. Lansdale, the man behind Bubba Ho-Tep, are all writing episodes of the new series. Greg Nicotero will direct the first episode and he previously revealed that all of the stories will vary in length and tone. Creepshow season 1 will consist of six episodes, but Shudder has not yet revealed a premiere date. Only that we should expect it sometime in 2019. We'll be sure to keep you posted as any further details on the project wash ashore. Feel free to check out Stan Spry's Instagram post below. This news was first reported by Production Weekly.